Instead of traditional corned beef and cabbage opt for steak and Guinness pie for St. Patrick's Day. A richly flavored beef stew is hidden under a layer of buttery puff pastry. The dark Guinness beer lends a toasted underlying flavor to this stew that is necessary to make this recipe authentic. On the side, serve buttered sweet peas and carrots with roasted potatoes. Steak and Guinness pie is a must-have to celebrate this Irish holiday. Dice the steak and dust with flour. In a large pot over medium-high heat, brown the steak, bacon and onions in butter, then transfer to a casserole pan. Add raisins and brown sugar and Guinness. Cover and simmer for 2-2.5 hours, stirring occasionally. If necessary, add water if the gravy becomes too thick. 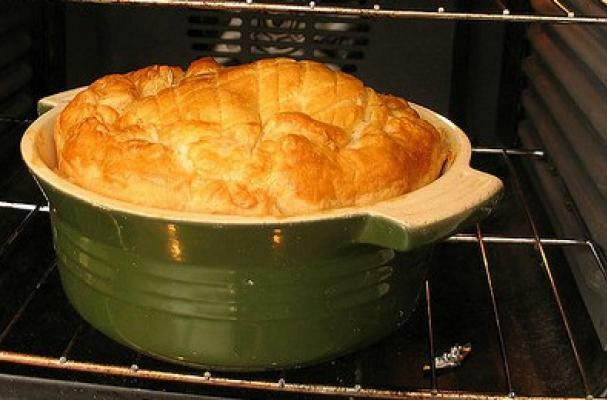 Coat a pie dish with half of the pastry and bake. Add the meat and gravy mixture and place the remaining pastry on top.